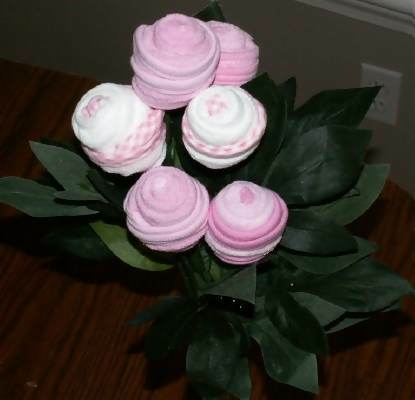 Make a fun bouquet of washcloth roses as a gift for a new baby! These baby roses are not only beautiful but definitely useful for both momma and baby during bath time. This gift is very easy and inexpensive to make. These instructions and techniques were personally created by me and different from others you might find on the web. See the picture instructions below to get started. Straight pin or double sided sticky tape- optional: helps hold the roll together as you pull edges upward. Note: the kind of flowers don't matter, you will be pulling off the flowers and using the stems later. 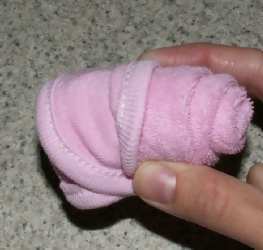 Create your baby rose by placing a washcloth on a flat surface in front of you. Fold it once in half. 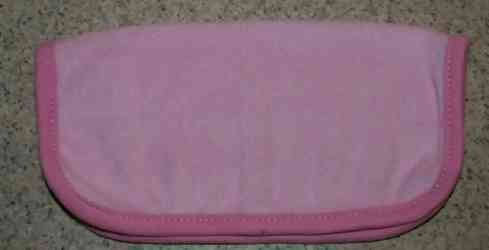 Roll the washcloth from one side to the other lengthwise. You will want to angle it slightly to get the rosebud look. 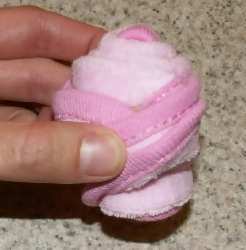 Use a straight pin, double sided sticky tape or your fingers to hold the roll in place as you take the bottom edges and roll them upward one at a time. As you pull upwards, it will cover the edge of end of your original roll, keep it from unraveling. Take all of the flowers off of your group of silk flowers. Thread the stem up through the hole in the bottom of your rose. Add all of your roses to the bouquet and place in a vase to display. Add tissue paper around the bouquet before placing in vase. Add silk baby's breath and silk roses to your bouquet. Use curling ribbon, decorative ribbon or raffia to decorate the vase. 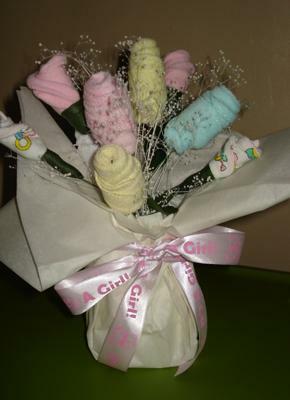 Another baby shower craft that is close in design to this is the baby sock rose bouquet. We have more ideas on that page along with reader photos. Here are a few photos that our readers have shared with us! I made this bouquet very similar to the one shown on this site, but I gave it my own twist. 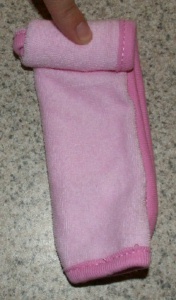 I used baby washcloths, scratch mittens, and socks.